A bird protects his baby in a nest built upon a skull in Freising, Bavaria in Germany which makes for an interesting picture. Animals find the strangest places to build their nests, but this little bird seems to think that the top of this animal skull in Freising, Bavaria makes the finest of homes. In reality, this Amsel bird is protected from any creatures that may head in towards the nest from the wrong direction as the horns on this skull could be deadly. Underneath the parent bird, you can see the baby peeking his head out of the nest as the long head on the skull decorates a snow colored wall. A picture that once seemed so simple, but in all honesty it can tell a tremendous amount about the livelihood of the Amsel bird. nest in Freising, Bavaria in Germany, Europe. An Amsel Bird is actually a blackbird and is usually taken care of by the father as the mother is out searching the landscape for food. Both parents are very protective of the little bird, but as this picture shows, the oddest places can make the best places for a nest. Europe is a popular place for this type of bird and as the Spring season takes place, you just never know where you will find a nest of birds, like this picture we captured in Freising, Bavaria in Germany. 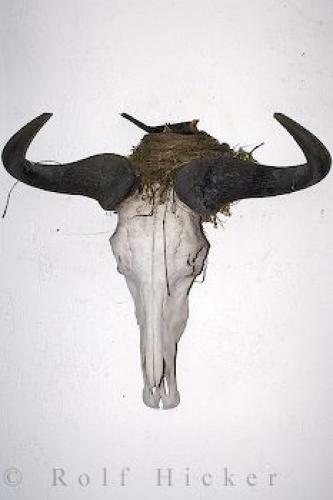 Amsel Bird in a nest on an animal skull in Freising, Bavaria, Germany, Europe. I photographed this photo with the digital SLR camera model Canon EOS-1Ds Mark II, aperture of f/6.3, exposure time of 1/320 sec. on ISO 200, as always I used a original Canon Lens, the focus lenght for this picture was 100mm.